I did not run any ads, promote my content anywhere or change my posting frequency. Instead, I was inspired by this prerecorded webinar by Tim Paige of LeadPages which talks about how the company grew its business from 0 to 15,000 paying customers. Paige reveals his best tactic to get visitors to give their email and buy his product. I knew I had to test this. I didn’t have a budget for ads, all I wanted to do is write awesome content on my blog and get my visitors to purchase my product. I did one thing which attributed for the change in traffic you saw in the graphs above: I added calls to action tailored to what the visitor was reading. For instance, they would leave their email address to get a PDF summary of the article they read, accompanying templates or any materials that were directly related to the post. 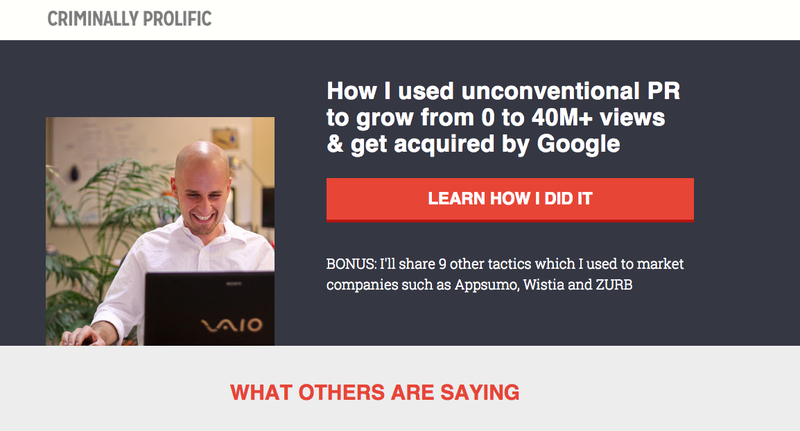 As a result, between 5 and 20 percent of visitors started opting in to my email list. Just by offering a little bonus material in return for their email address, my traffic shot up. In the first two months, I gained 3,000 subscribers, resulting in 250 clicks to my website when I sent out an email blast. I picked an article I wrote. For example, here is a piece about a DIY PR strategy for startups. I thought about the specific material each website visitor would like to have after reading the article. In this particular case, I determined high-quality email template for pitching journalists would be a great giveaway in exchange for an email address. The important thing to highlight here is that this is super targeted to the readers of this particular article --they’re reading about doing their own PR and I’m offering them email templates to help them implement what they just learned. 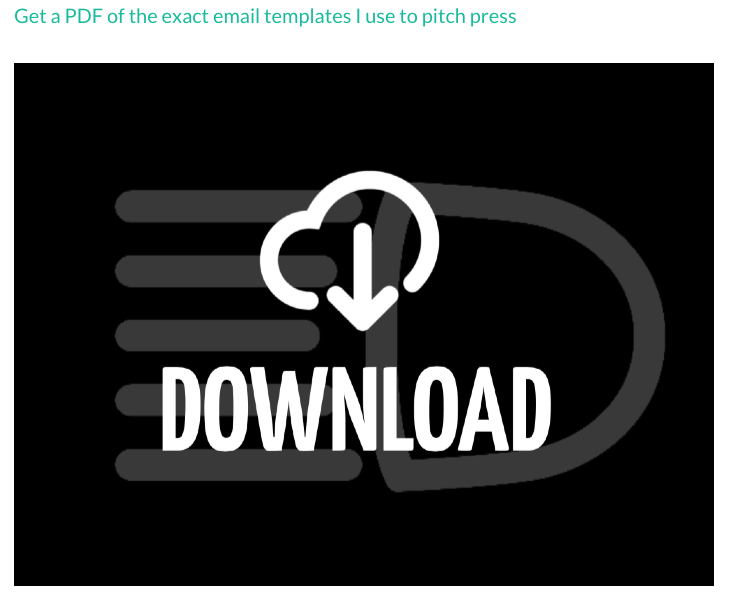 I used LeadPages, a landing page generator, to set up the prompt in the article for readers to download the email template for pitching press. If they choose to provide their email address, they will receive an email from me with the relevant free resource. At the very end of the article I put a giant call to action that looks like this, directing the reader to the exact same process as mentioned above. If they do agree to receive future emails and hit the "confirm" button, they will also get the following email with the materials they requested. Reply to this email right now and tell me one thing that you're struggling with. Even if it's teeny tiny…I want to hear about it. Just hit "reply" and say "Hey" (I love meeting Criminally Prolific subscribers). I receive a TON of emails every day. I do my best to reply to as many as I can. If I don't respond to you rest assured that I read your email and will respond very soon. Fifty percent of the people respond to this autoresponder email. Now I have highly targeted visitors, and I learn their pain points, too. Targeted calls to action to leave an email address have worked great for me website, resulting, at minimal a 30 percent conversion rate. It works just like all the popups above and the conversion rate is about 6 percent of all my visitors converting to email subscribers. Besides writing on my own blog, I have also started contributing to others sites, like The Next Web, with call to actions (e.g. links to download PDFs). I have also started writing PDF ebooks and special reports and giving them away in exchange for an email address. Finally I decided to change the homepage on my website. It used to describe my past work but now it focused on my marketing consulting services. 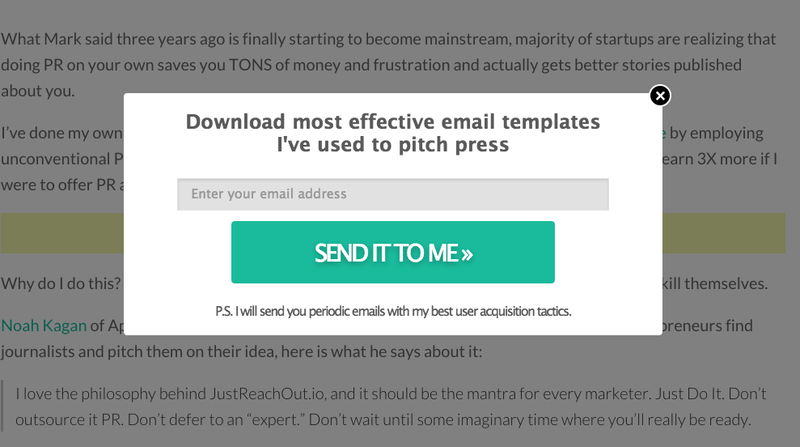 Fourteen percent of people who visit my homepage leave their email address through this call to action. Using the calls to action I describe in this article helped me get more than 5,000 addresses in the last six months. The more people I have on my email list the more people come back to my website every time I email them with a new blog post and the more share articles are shared with their friends and followers. Those new friends and followers come back and sign up to receive emails from me. By doing this process, I spend $0 on marketing. Instead I write good content and make sure I have a good call to action in each blog post to make sure people leave me their email addresses.